There’s a new Boshin in town… In the span of just a few years, Honshu's remarkable "Boshin" cutlery line has skyrocketed to international renown and acclaim, gaining a diverse following numbering in the thousands. From tactical cutlery fanatics to staunch devotees of ancient Japanese swordcraft, blade enthusiasts of all stripes share a common love and respect for Boshin swords and knives, lauding their unique blend of tradition and innovation, style and function. The legendary Nepalese kukri is the latest historic blade to undergo the "Boshin transformation." 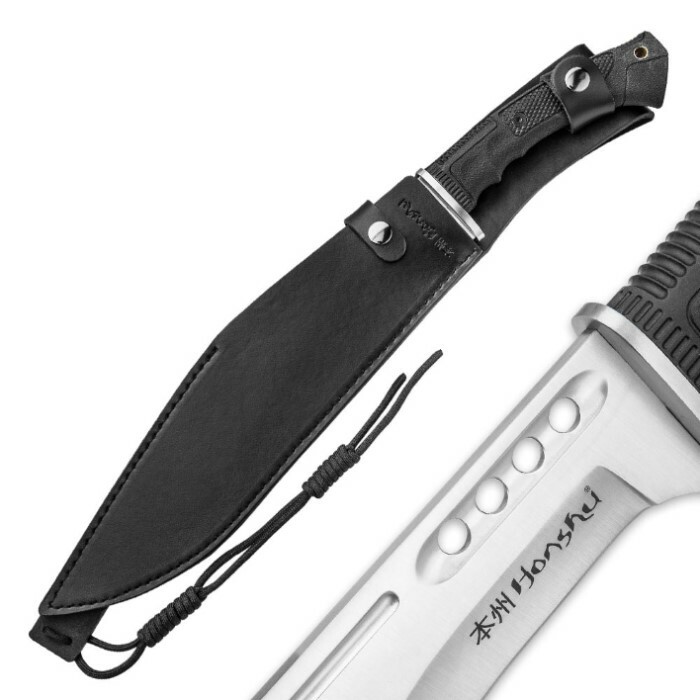 Just as it did with the katana, wakizashi and bowie, Honshu rejuvenates and redefines this centuries-old machete variety, adapting it to suit the unique challenges of modern combat and outdoor adventure. 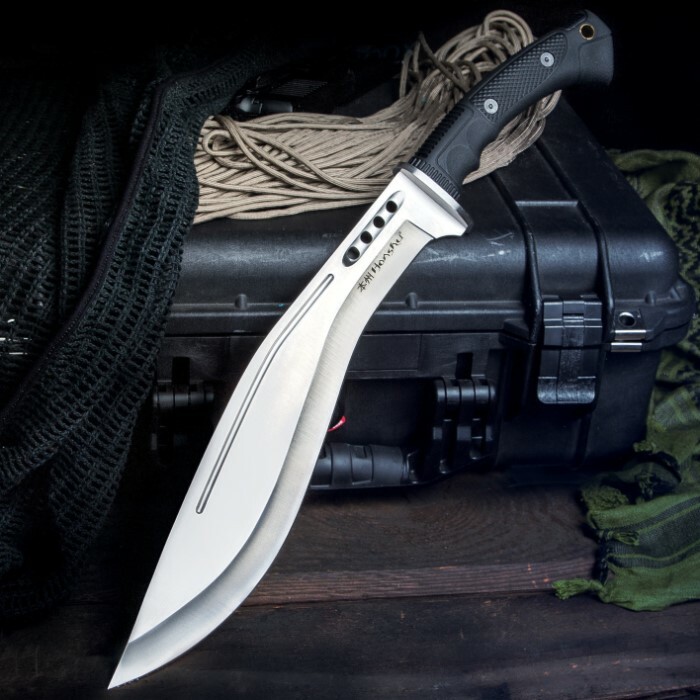 Distinctive kukri profile + Boshin engineering = Blade with unequaled cutting power The kukri has long proven deadly on the battlefield and indispensable in the rugged Himalayan highlands where it originated - even earning the moniker "the king of all knives." This is due in no small part to its distinctive inward-curving blade profile, which boosts forward momentum for unmatched chopping power. The Boshin retains this time-tested blade form, bolstering it with resilient, modern 7Cr13 stainless steel and rock-solid full-tang construction. Chic cut-outs, a menacing blood groove and a brilliant satin finish add contemporary tactical flair. 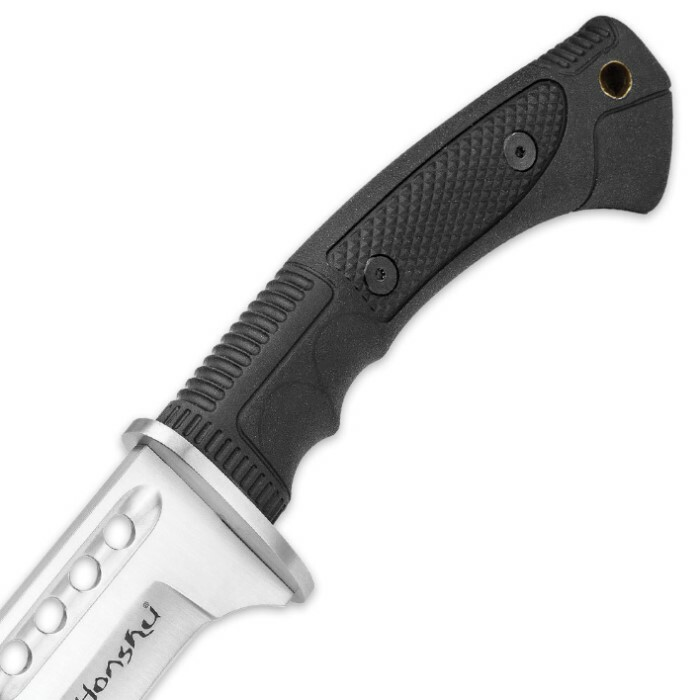 Battlefield, back country, even your own backyard - it's all Boshin country Like its Nepalese forebears, the Boshin is perfect for chopping wood; but precision engineering and improved weight distribution impart a level of versatility that goes well beyond that of the average kukri - modern or historical. The Boshin makes quick work of practically any cutting task - from delicate jobs like fashioning a snare from twigs to rigorous chores like clearing tangled vines and dense brush. But no matter the task, the Boshin makes it quicker and easier, thanks in part to its sublime hand-feel and shrewdly designed handle. New weapon, same legendary Boshin feel Made of state-of-the-art TPR, the Boshin's handle is rugged, waterproof and a pleasure to grip. Ergonomic contours and exquisite texture provide an impeccable, slip-free bond with the hand, reducing fatigue and improving control. This, along with flawless balance, gives the Boshin an overall feel that defies description. No doubt about it - wielding the Boshin is truly a one-of-a-kind experience. 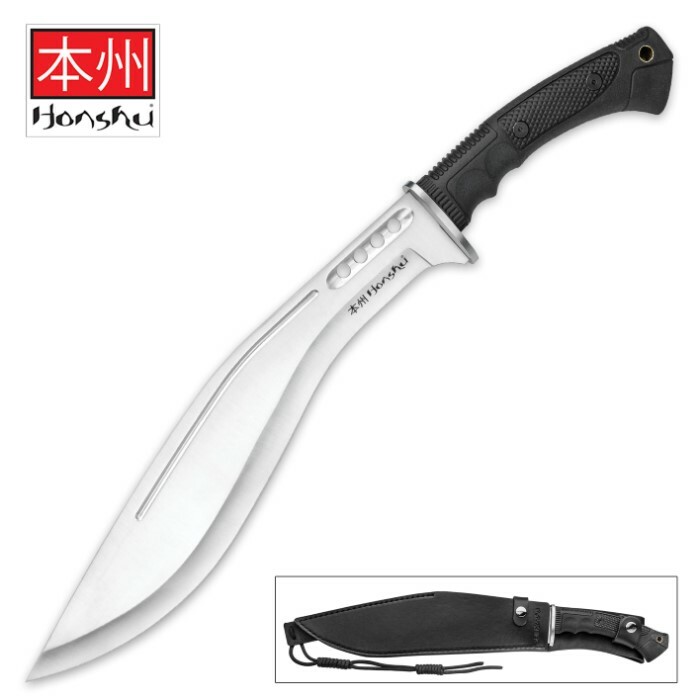 Unbeatable Boshin value built in - outperforms machetes priced two, three times as high Try the Boshin Kukri just once, and you'll never settle for another machete. And why should you? Like all the swords and knives in Honshu's Boshin line, the Boshin Kukri sets a new standard - for both quality and value. No other machete at any price compares. Why work harder? Why pay more? 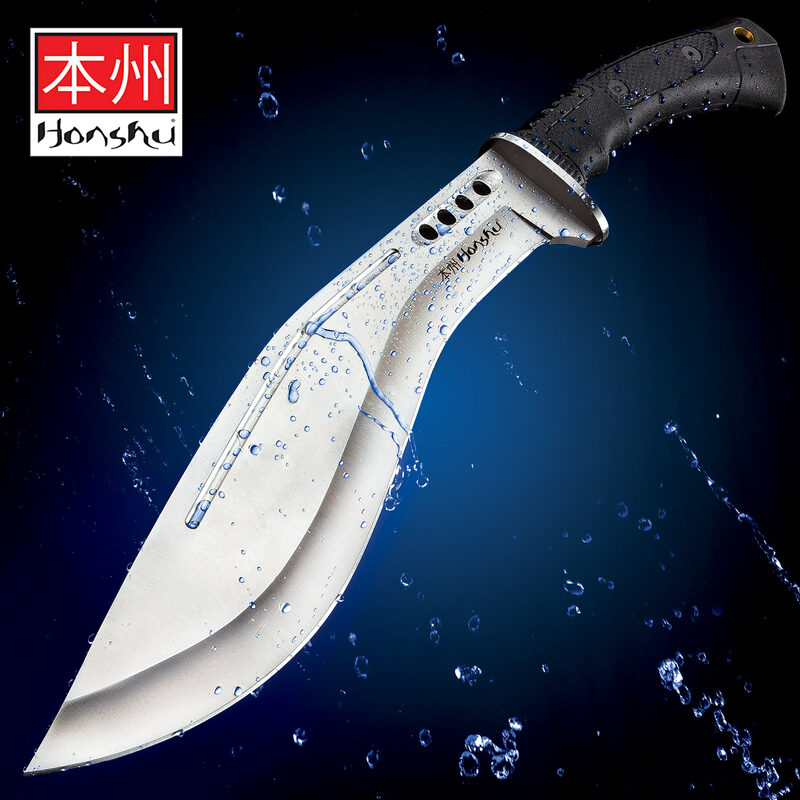 Add the potent, efficiency-boosting Honshu Boshin Kukri to your arsenal today and work smarter - for less. AWESOME Design But Maybe I Got a Factory Defect?